The Department of Politics studies politics in creative and inventive ways. We emphasize the theoretical dimension of political analysis in both political explanation and normative evaluation. 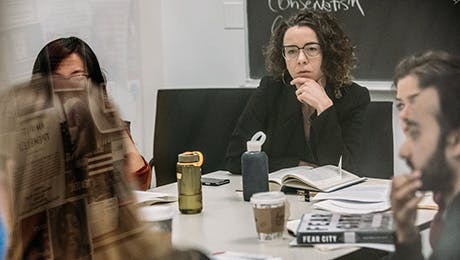 As an engaged, inclusive, and scholarly community in New York City, faculty and students explore historical and contemporary political constellations with rigor and enthusiasm. While studying at the Department of Politics, you will engage with a wide range of political theories and specific disciplines. Both faculty members and students help rethink the field's understanding of how institutions shape political life, the intersection of political and cultural processes, and the classical and current conceptions of political economy. The Department of Politics learns from and contributes to the scholarly community that is The New School for Social Research through joint courses, research projects, and conferences. For example, the Zolberg Institute on Migration and Mobility, named for Professor Aristide Zolberg and directed by former UN Deputy High Commissioner for Refugees Alex Aleinikoff, engages in research, policy analysis, and education bearing on international migration, refugees, and the incorporation of newcomers into host societies. Distinguished visiting scholars from other institutions join our faculty on a regular basis. These visiting professors play an important part in the department assisting regular faculty with dissertation supervision and other student work. In the last six decades the Department of Politics has had some of the most distinguished social scientists in the world as members and closely affiliated faculty, including Hannah Arendt, E. J. Hobsbawm, Ira Katznelson, Charles Tilly, and Aristide Zolberg. The Department of Politics offers an MA and a PhD degree. Courses in Politics combine a deep theoretical framework of political ideas with real-world implications and applications on personal, national, and global scales. An interdisciplinary approach helps shape a better and more complete understanding of how politics work, why policies work, and where cutting-edge approaches might take us next.